What is the difference between DC vs AC ceiling fans? DC means direct current, AC means alternating current. AC changes direction 50 times a second. Both have been around for a long time and DC is used in batteries but originally DC meant a drop in power as you got further up the wire away from the source which was a serious practical limitation. 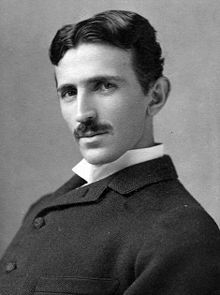 Then along came Nikola Tesla who was the father of AC motors and generators and who invented the first AC motor and transformer which was then licensed to Westinghouse. With AC at any voltage, it can be transformed through use of the highly efficient transformer to any other voltage. Stepping up the voltage has the effect of stepping down the current for the same power transfer. The AC electric generator determines the frequency of the power. 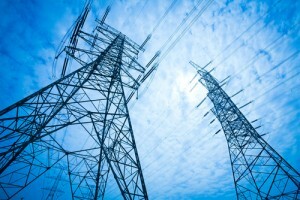 What is unique and so important about AC is that the voltage can be easily changed making it more suitable for long-distance transmission than DC electricity. The power lost in transmission is proportional to the current. So by making the current smaller the power lost is smaller. At the same time as the current is stepped down by a transformer the voltage is stepped up which is why long distance power lines are at very high voltages. The other major benefit of AC is that it can be used with capacitors and inductors in electronic circuitry enabling tuning of circuits to take place. This has meant that a wide range of applications to be created which is why it has been commonly used in domestic appliances and still dominates them today. Drive) of phase control. These often end up absorbing a lot of power and turning it into wasted heat. Nothing beats a DC control for energy savings, cost, size, safety or controlability but they are more expensive. The more sophisticated and expensive ECM AC motor controllers now actually switch the AC into DC current. The effeciency savings are substantial with up to 70% less energy consumed for the same air output. Typical values range from 600 m3/h/w (350 cfm/w) to 1100 m3/h/w (650 cfm/w) at low speeds.This means that a 25 w DC driven fan uses the same power as a 100 w AC driven fan. Now add in the use of a low energy light bulb which will use 1/5 of the power for the same light output and the total savings are immense. What this means in practice is that you can keep your fans running around the clock in places like shops and restaurants where there is plenty of heat generated by the lighting. The peak in rush/peak starting current of a brushless DC fan typically will be a function of circuit resistance and power resource. A lot of brushless DC fans incorporate additional filter capacitance for electromagnetic interference (EMI) suppression. Depending on the circuit location, the capacitance may represent a very high instantaneous in-rush current spike. The ratio of peak starting current to running current can be quite large, eg., 4:1 or 5:1. 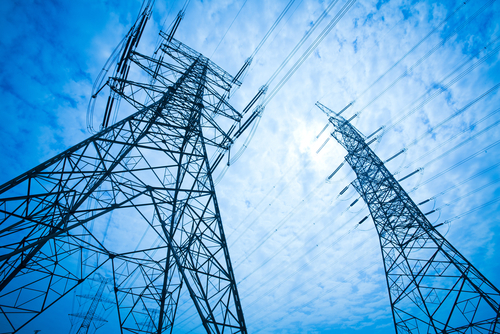 To overcome the stress that would be placed on the power supply they use a form of current limiter so that the peak current draw typically will be limited to values of 2.5 to 1 or less. This limiting of current also limits the starting torque of the motor, which will extend the time needed for the fan to reach full speed. Manufacturers of DC ceiling fans compensate for this by using a higher voltage (which is easy to do) which means that their fans have much higher starting torque that their AC counterparts with the resulting time to reach full speed being less than equivalent AC models. A DC ceiling fan uses 70% less energy for the same airflow as a conventional AC ceiling fan. They have better controls of different speeds (more speed settings typically 6) and are a smaller size for a given output of air movement. Being “brushless” it should also be quieter and less prone to the buzzes that can appear on cheaper AC ceiling fans and also quicker starting. 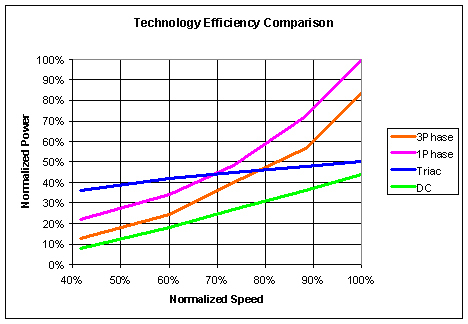 Due to the more complex electronics they are more expensive than an AC design. Check out the amazing new DC low energy ceiling fan additions to our range that deliver all of the benefits discussed here. Graph from Control Resources Inc.